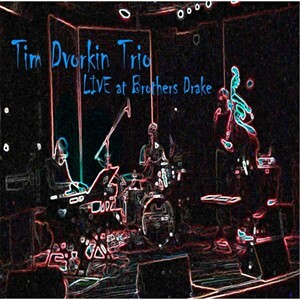 Pianist Tim Dvorkin and his trio, with Bradley Mellen on acoustic bass and Rick Soriano on drums, recently released a new album entitled Live at Brothers Drake. Recorded by Aaron Oakley at a Jazz Wednesday appearance by the band, these seven tracks of original compositions by Dvorkin showcase this high-flying unit in vibrant color. The band will celebrate the album’s release in its place of creation, with a Release Party on Wednesday, January 20th from 8 to 11pm at Brothers Drake. There is no cover, and CDs will be for sale. The band will also be in action on Saturday, January 23rd at Whitehall Yearling High School when they perform a 7:30pm opening set for the next installment of the Jazz Brew Concert Series in support of the future Jazz 98.5 FM. Urban Jazz Coalition and the Broad Street Lineup will follow – tickets are available here. The album is also available digitally at CD Baby and other major outlets. Keep reading for a review of the album and video from the recording. Album opener “Grooveland” starts with Mellen rumbling into a groove before the band joins him and Dvorkin’s propulsive melody rockets forward. Mellen’s quieter intricate solo adds contrast, but Dvorkin soon returns with more fireworks and Soriano contributes his own sizzling solo. “G-Force” is a moodier track, with Dvorkin’s melody employing a bit of internal call-and-response before he goes searching for distant lands in his solo. “Two Moons” storms out of the gate with a thunderous groove chorus before extended solo passages from Mellen and Dvorkin and some pyrotechnics from Soriano. After a few intense numbers, the relaxed groove of “Lollipop Candy,” established by the leisurely strut of Mellen’s bassline, comes at the right moment and sets the stage for some slinky keys from Dvorkin. The darker hues of “Without You” fit the title quite well, but Soriano’s precise rhythm keeps the proceedings on course, and Dvorkin’s uplifting lead at the end of the chorus eventually propels the tune into a sunnier place. Dvorkin’s percussive, wide-ranging lead on “Some Like It Hot” marks the coming of further keyboard wizardry, and Mellen hits some of his heaviest grooves of the album in his solo, which is saying something. Album finale “Southern Jam” is an appropriate conclusion, with a menacing keyboard melody, big solos from all three players, and a fiery conclusion.